Produced by the award-winning filmmakers of the highly acclaimed feature film The 13th Day, this is a powerful and in-depth documentary that combines archival footage, dramatic reenactments, original interviews with Fatima experts and stunning visuals to tell the whole story of the apparitions of Our Lady of Fatima. 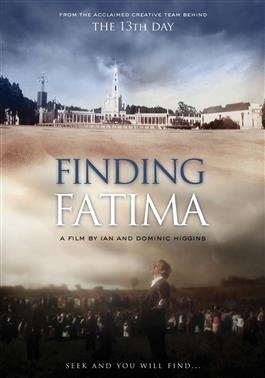 With high production values and a beautiful look, artists and filmmakers Ian and Dominic Higgins present a compelling docu-drama on all the crucial details about the appearances and messages of Our Lady in Fatima in 1917, a message of prayer, penance and conversion that is desperately needed in our modern world. From the initial apparitions of the Angel who prepared the children for Our Lady's coming, to the Miracle of the Sun, including moving film footage from The 13th Day, this illuminating and inspiring film will impact all those who see it to personally take heed of the critical messages of Our Lady of Fatima. "Great new DVD from the makers of The 13th Day! This film, Finding Fatima, is shot in the same Bresson-esque and super-stylized way as The 13th Day. While hearkening to and honoring filmmaking's past, the Higgins brothers are simultaneously bringing the story and message of Fatima to a new generation. They use clips from The13th Day for the re-enactments, as we get to know the personalities of the three visionary children in depth. This documentary is chock-full of fascinating, down-to-earth interviews and historical footage, all presented in a spritely way. There's not a dull moment in this life and joy-filled documentary, even with its more sombre sepia-toned visual edges! Innovative without being novel or gimmicky, Finding Fatima has a 21st-century feel to it.